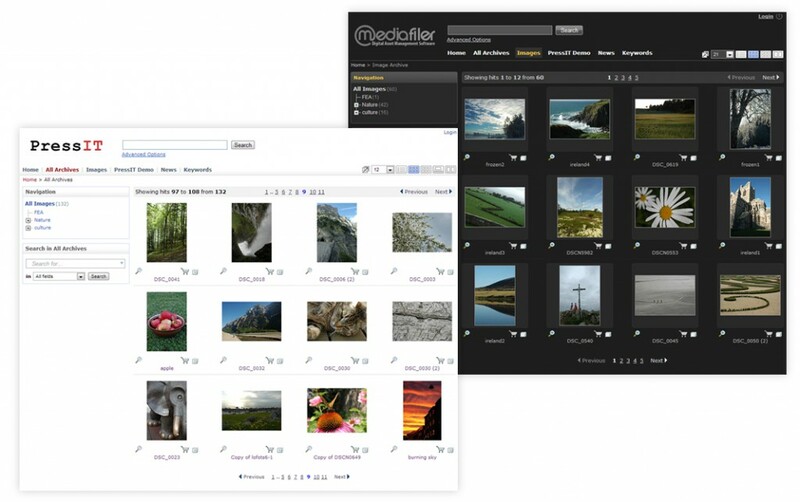 Archiving your digital assets is fast and easy with MediaFiler. The software is modular and therefore highly customizable both in functionality, layout and appearance! When you start typing a search word, the auto-fill functionality provides suggested words existing in the metadata in the archive. You can narrow your search by defining metadata field, file type and date range. 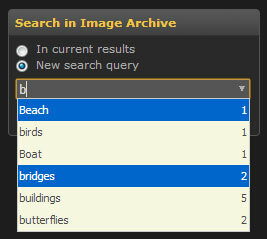 Using lists of categories and subcategories makes it even faster to find your images. Just choose a category or a sub category and your images appear! MediaFiler also includes an own page showing you the search index with the archives’ attached metadata; here you can select archives and fields to see the metadata existing in the archive. You can also search for more images by selecting multiple keywords on an image preview page. Users can create albums/lightboxes with selected files. This is a useful feature for collecting favorite files, or for selecting images for a project. With one click you can download the contents of the album. The albums can also be shared with other users from within MediaFiler. You can email the link to view the album or share the album with links to download original files. An address book for storing your contacts is also available. Albums are a handy tool for organizations who produce press releases or media stories. 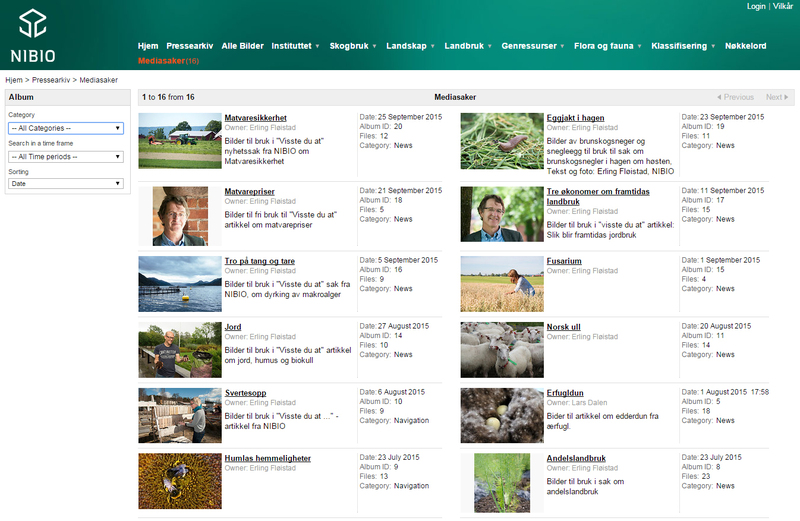 The story and the images can be collected in an album and shared with all media contacts. Read more about this here. MediaFiler provides user friendly shopping cart funtionality. This allows guests / users without download rights to send a request for the images they wish to use – which then can be processed by the responsible editor. 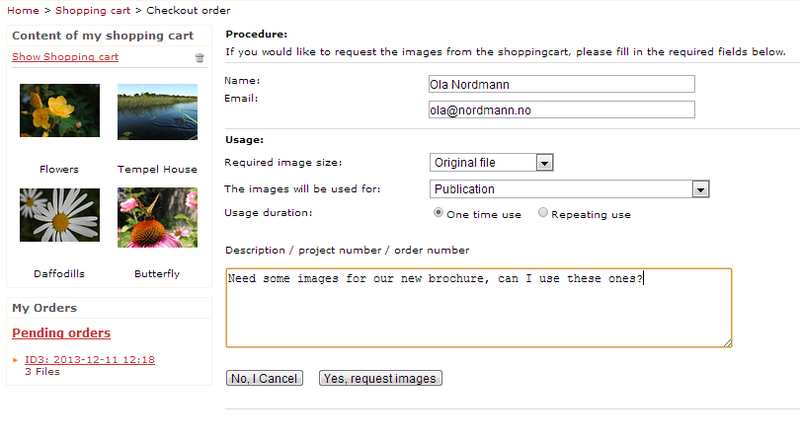 The user simply adds the images to the shopping cart and provides relevant information on check-out. The editor can choose to approve some or all of the files in the order, and may also change the size specifications of the individual files before approving the order. It could not be easier to upload files. MediaFiler provides uploading directly in the browser (Flash, Java and single upload is available). You can upload single or multiple files, folders with subfolders, and ZIP archives are automatically unzipped. Using the Java upload, you can simply drag and drop the files into the upload window. You can choose whether existing files should be overwritten or not, and you can add metadata on upload. MediaFiler is using XMP, IPTC and EXIF standards. This is a flexible and robust solution for companies and organizations who depend on several software programs throughout their workflow. MediaFiler support a range of file formats, which are available to view (and play) in the browser archives.